Temple Tree hotel on Langkawi Island, Malaysia. 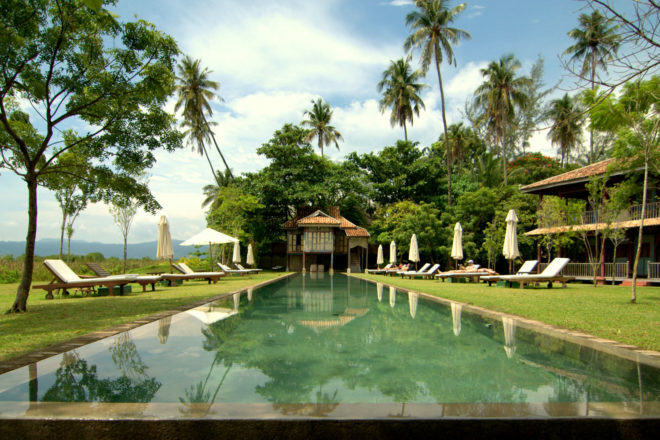 History meets modern luxury in a stunning lakeside setting at Temple Tree hotel, on Langkawi Island, Malaysia. Temple Tree offers travellers a unique chance to live in a heritage building tweaked with modern touches. The latest resort by Australian interior-designer-turned-hotelier Narelle McMurtrie, each house is unique in design and decor. The 1920s-era Colonial House, once the home of gold traders in George Town, has hand-painted floor tiles and a fish-scale design canopy over the porch. While the 80-year-old turquoise-hued Penang House has accents of an art deco cottage, adapted for the tropics with shuttered windows and wooden floorboards. Resort life revolves around the two lap pools, overlooking a lily filled lake and Straits Club House, a rambling wooden house with an extensive wine list and excellent chicken tikka on the menu.